UpSpring Milkflow is a known brand with a wide variety of products made to improve mother’s milk quantity and quality. In this post, we will be introducing you to the UpSpring’s best products with their details and reviews. UpSpring’s range of products includes lactation capsules and powder drinks that come in different flavors. So to all mothers who want to make more milk, there is always a Milkflow for that! This Milkflow supplement contains four of the most effective galactagogues – fenugreek, shatavari, anise, and blessed thistle. This supplement comes in capsule form and contains all natural ingredient to help in healthy breast milk production. This formula not only helps you absorb the galactagogues effectively, it also adds essential nutrients in your diet for a good quality breast milk. This supplement also provides digestive support for breastfeeding moms. Milkflow Max concentrated capsules are the ultimate in effectiveness and convenience for breastfeeding moms. Milkflow Max capsules help in promoting healthy breast milk supply, therefore supporting optimum nutrient absorption. These capsules also aid in establishing a sufficient breast milk supply for your baby, especially when your baby needs more breast milk than you are currently producing. Increase as needed to a maximum of 4 capsules daily, spaced throughout the day. UpSpring consider this supplement as a better and easier alternative to fenugreek tea due to its capsule form. 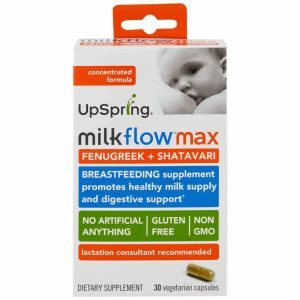 Milkflow Fenugreek + Blessed Thistle Capsules contain a proprietary blend of herbs to support breast milk production – fenugreek, blessed thistle, and anise. Since they come in capsule form, they are a lot more fast and convenient than tea plus you don’t have to deal with the leafy unpleasant taste of fenugreek tea. This formula is very potent since it contains 3600 mg of concentrated fenugreek seed extract in each serving. This means you only have to take 2 capsules per day, compared to 6 or more capsules with other brands. Saving you more money and lesser capsules to take. Milkflow Fenugreek + Blessed Thistle Capsules can help in establishing a sufficient milk supply for your little one and when you want to increase pumping yields. Basically similar to the previous product, this supplement also helps you catch up with your baby’s breast milk demand. If needed, increase to three times per day. The berry flavor in this drink is very convenient and mothers who have very picky taste buds will totally love this drink mix. The in Milkflow Fenugreek + Blessed Thistle Berry Drink Mix does not only include fenugreek in their formula but also blessed thistle and anise to help in improving milk production even more. Moms really love that this does not come with a leafy and tea-like taste but in a fruity, berry one which makes them enjoy this milk lactation supplement drink even more. 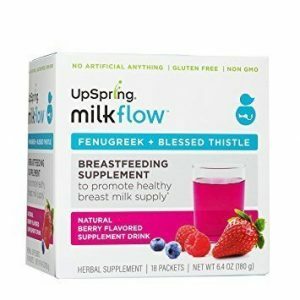 Just like the other Milkflow supplements, Milkflow Fenugreek + Blessed Thistle Berry Drink Mix can help if you’re trying to establish a sufficient breast milk supply for your baby to keep up with your baby’s demand especially when your baby needs more breast milk than you are currently producing. Mix a packet of Milkflow with 8 to 10 ounces of water or juice. You can even make your own lactation smoothie by adding a packet to your favorite green or berry smoothie! UpSpring Milkflow has provided moms with a healthier choice of a lactation drink supplement free of added sugar with no extra calories. Many moms will love this and benefit from this drink, especially those who have experienced gestational diabetes or those who are currently suffering from diabetes. This drink mix concentrates natural herbal extracts including fenugreek, blessed thistle, and anise that help promote healthy breast milk production. Fenugreek and blessed thistle are always both a go-to for breastfeeding moms, and our unique Milkflow formula is lactation consultant-approved to help with supply. This one is similar to the above-mentioned berry drink mix without the sugar and extra calories. This drink mix can totally help if you are trying to improve and establish your milk supply, especially when your baby asks for more. Mix one scoop in 8 oz. of water or your favorite juice and stir. Also, try blending with sparkling water or even into a smoothie. For those mothers who think that drinking fenugreek tea is a challenge because of the taste, this drink mix is a wonderful alternative. 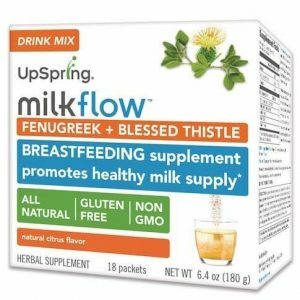 Milkflow Fenugreek + Blessed Thistle Drink Mix also comes in citrus flavor which moms love because of its refreshing flavor and it is very quick and easy to prepare. The same with UpSpring’s other Milkflow drinks, this one also help mothers in improving their breast milk supply so you will be able to give your babies the breast milk they need. Mix a packet of Milkflow with 8 to 10 ounces of water or juice. You can even make your own lactation smoothie by adding a packet to your favorite orange smoothie! You can also add this to sparkling water if you want. For all the chocolate lover moms out there, this is the tastiest lactation drink for you. UpSpring made no limits and produced the first chocolate flavored fenugreek drink, formulated to help mothers in boosting their milk supply. This drink mix also helps mothers who find it hard to swallow capsules or those who hate the taste of traditional fenugreek tea. 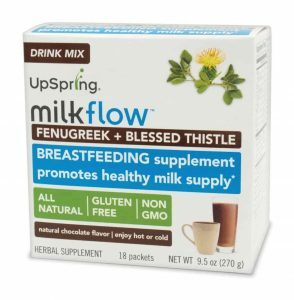 Milkflow Fenugreek + Blessed Thistle Chocolate Drink Mix can help mothers who are trying to establish a sufficient milk supply for their babies especially when your baby needs more breast milk than you are currently producing. Mix one packet with 6 to 8 oz. of cold or hot milk, and enjoy. For our tea-loving mothers, UpSpring has created a unique lactation drink in chai tea latte variant to satisfy your tea latte cravings at the same time boosting your milk supply. Moms love that this tea latte drink mix is really tasty and also filling. Similar to the previous drinks mentioned, Milkflow Fenugreek + Blessed Thistle Chai Tea Latte Drink Mix can help mothers establish a good supply of breast milk for their little ones. Especially when your babies are on their growth spurt and needs more milk. If you seem confused as to what flavor to choose, worry no more since UpSpring provides a Try All 4 Flavors for One Low Price product that includes a sample pack of each Milkflow flavors – Berry, Citrus, Chocolate and Chai Latte. 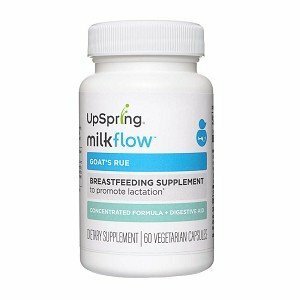 This single-herb breastfeeding supplement from UpSpring contains a concentrated formula of 900mg of Goat’s Rue leaf extract with added digestive aid to help reduce symptoms of possible upset stomach for both mommy and baby. Through these single-herb supplements, mothers are able to determine which of the galactagogue herbs are the most effective for them when it comes to boosting milk supply. Just like any lactation supplement, Milkflow Goat’s Rue Capsules can help every mother in establishing a sufficient milk supply and helps them increase pumping yields. These Goat’s Rue capsules may help stimulate the growth of mammary tissue and be especially helpful for adoptive mothers and mothers who have had previous breast surgeries or did not experience breast growth during pregnancy. Take 1-2 capsule, 3 times daily. Discuss product use and intake with a healthcare professional during pregnancy. 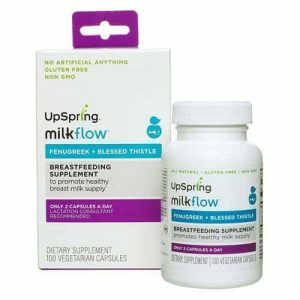 UpSpring’s all natural Milkflow Malunggay Capsules help promote healthy breast milk production. This single Malunggay herb supplement contains 350 mg of concentrated Malunggay extract in each serving. Same with the above mentioned single-herb supplement, these malunggay capsules are also made with digestive aids to help in reduction of potential digestive problems and upset stomach for mothers. Through these single-herb supplements, mothers are able to determine which of the galactagogue herbs are the most effective for them when it comes to boosting milk supply. This also gives them the opportunity to mix and match the best galactagogues that worked really well for them. 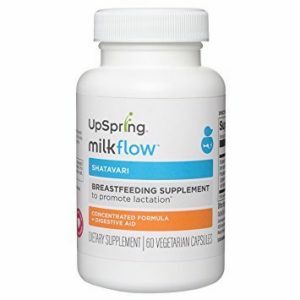 Like any of UpSpring Milkflow supplements, Milkflow Malunggay lactation supplement capsules can help if you are a mom who is trying to establish a sufficient breast milk supply for your baby. UpSpring’s Milkflow Blessed Thistle Capsules help promote healthy breast milk production. This variant of breastfeeding supplement gives 1000mg of concentrated Blessed Thistle extract in each serving with a digestive aid to help reduce and avoid an upset stomach. As a single-herb supplement, this allows you to determine which herb will work best for you or come up with customized combinations of the different single-herb supplements. Helping you boost and your milk supply even more. The Blessed Thistle capsules by UpSpring can help you establish a very health and sufficient breast milk supply for your baby. And stops you from worrying about keeping up with your little one’s demand. Effective in promoting and improving healthy breast milk supply. Take 1 capsule, up to 3 times per day. For centuries, shatavari has been known not only to improve breast milk supply but also to support healthy female reproductive system. This herb contains phytoestrogen that helps to naturally balance and regulate hormone production in women. UpSpring’s Milkflow Shatavari capsules effectively help in promoting healthy breast milk production. Each serving gives 500mg of concentrated Shatavari extract with a proprietary blend of four herbs namely, ginger root, anise seed, orange peel and lemon balm leaf, to help in reducing symptoms of potential digestive problems. Each bottle contains 60 easy-to-swallow capsules. There are a lot of breastfeeding supplements to choose from. What is important is that you will know and get which one will work best for you and which of those supplements will give you little to no side effects.